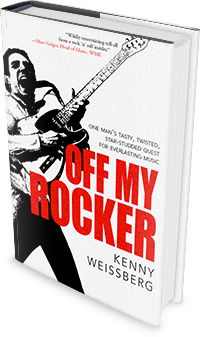 Three chapters of Off My Rocker chronicle the creation and evolution of Kenny & the Kritix, a band I put together on a dare in 1980, at the age of 32. It was my first and only band. With the help of one of my favorite musicians, bassist Mark Andes (Spirit, Jo Jo Gunne, Firefall, Heart), I assembled an all-star band for two performances at the Blue Note in Boulder on December 3–4, 1980. It was supposed to be a one-shot deal, but the response was so life affirming that I fronted several versions of Kenny & the Kritix for the next three and a half years. 1982: A rockumentary on Kenny Weissberg of Kenny & the Kritix, produced and directed for KBDI-TV (Denver) by Michael Drumm. August 29, 1981: Version 2.0 of Kenny & the Kritix covering Ducks Deluxe’s “Fireball” at the Blue Note in Boulder, CO.
October 27, 1982: Version 3.0 of Kenny & the Kritix covering David Bowie’s “Suffragette City” at an in-studio performance for Waveform Rock Video (KBDI-TV). 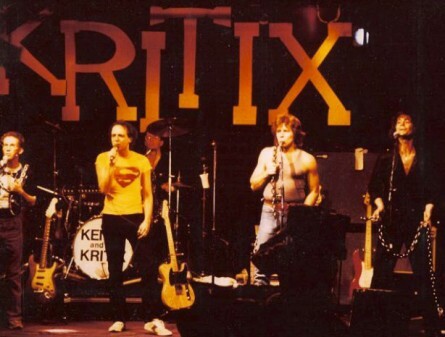 Check out Kenny & the Kritix on YouTube for more live performances and TV shoots, along with rehearsal footage and two scripted introductory/encore videos used during our live shows. Gratitude forever to Kritix of all stages: Mark Andes, Sam Broussard, Jamie Kibben, Brian Brown, Michael Reese, Milt Muth, Chip McCarthy, David Muse, Greg Overton, Jeffrey Wood, Michael “Hawk” Hawkins, Peter Roos, Jamie Polisher, Dennis “Dr. Roc” Durakovich, Craig Skinner, Judy Rudin, Tim Duffy, and Jim Waddell (with cameo appearances by Karen Sony, Gaile Gillaspie, and Willy Cruz).